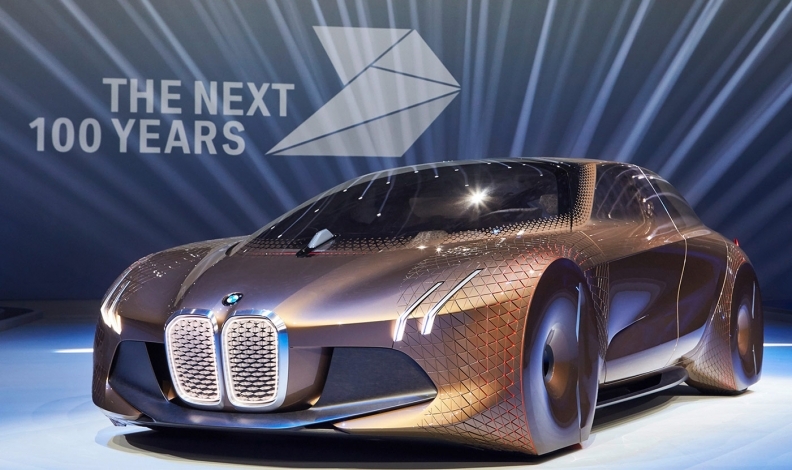 BMW's Vision Next 100 concept car, unveiled in 2016, explored a possible design for an autonomous vehicle. The automaker plans to roll out its self-driving system with the iNEXT crossover in 2021. MOUNTAIN VIEW, California -- While competitors such as Audi and Cadillac tout their semiautonomous driving systems, BMW plans to take more time before rolling out a high-speed self-driving system. Klaus Buettner, BMW's vice president of autonomous driving projects, told reporters last week at an event at the automaker's Silicon Valley office that BMW is spending the next couple of years working with suppliers and testing prototypes to ensure the automaker can introduce a system that can operate at high speeds in most highway driving situations, with the added benefit of being a backup operator in fully automated vehicles. BMW's system won't be available until 2021, which puts it several years behind competitors. Audi's new A8 has Traffic Jam Pilot, a Level 3 system — meaning drivers must supervise the system and be ready to take back control. Traffic Jam Pilot can operate in speeds below 60 kph (37 mph) in well-marked, physically separated highways, in places where it has been approved by local governments. Cadillac's Super Cruise, available now in high-end trims of the 2018 CT6, allows drivers to take their hands off the wheel on limited-access freeways with clear lane markings. Buettner said BMW chose to wait until it could introduce a system capable of driving at speeds up to 80 mph and making driving decisions such as lane changes on its own. To get there, the automaker is relying on partners and the ability to quickly build the system up to higher levels of autonomy. BMW plans to roll out its Level 3 system with the iNEXT electric crossover in 2021. In the meantime, it plans to deploy a fleet of 100 autonomous 7-series test vehicles. Forty of the vehicles will be operating worldwide by year end, and all 100 are to be on the road by 2019. Buettner said the fleet has jointly driven nearly 20,000 miles. He said about 150,000 miles are needed for safety validation, though most validation can be done in virtual simulators. "With Level 3 autonomy, there is a major impact for the whole architecture of the car," he said, saying the advances necessary to go from Level 2 driver assist systems to Level 3 were a "technological quantum leap." BMW is building its system with chipmaker Intel and camera sensor supplier Mobileye, which this year became an Intel subsidiary. The group is also working with Delphi, Continental, Magna and Fiat Chrysler Automobiles to integrate the system into other automakers' vehicles. In a consortium with German rivals Audi and Daimler, BMW jointly owns Here, a navigation supplier building high-definition maps for self-driving vehicles. Such maps will be critical for the operation of BMW's Level 3 and higher vehicles, Buettner said. "Cooperation is a core part of our strategy," he said. "We have to introduce more standards to the automotive industry for safety regulations, but also to share costs and broaden our footprint." With more companies working on the technology, industrywide standards for sensors and data management can be set, Buettner said, leading to faster deployment of fully automated vehicles. He applauded Delphi's acquisition of autonomous vehicle software startup NuTonomy last week as another step toward such industry consolidation. But nonexclusive collaboration has advantages and disadvantages for individual companies. Intel, one of BMW's core collaborators, also supplies chips for Waymo, Google's self-driving car unit. Simon Euringer, head of the BMW technology office, told Automotive News the arrangement could benefit the automaker as Intel dedicates more time to autonomous driving efforts, but also could distract the chipmaker from its work with BMW. "It's parallel development," Euringer said. "In some ways it's positive, but it could also potentially be negative." Rather than going straight to Level 4 autonomy — which requires no human supervision in defined conditions — like Ford Motor Co. and Waymo have said they will do, BMW sees Level 3 as a key step to achieving a safe self-driving vehicle. To remove humans from driving, components must have backups so if one part fails, another will take over and drive the vehicle without outside intervention. By building its Level 4 and Level 5 systems on top of its Level 3 system, BMW can use the Level 3 components to ensure the vehicle can still operate if other parts fail, Buettner said. "This puts our scalable architecture to a new level, with different safety mechanisms onboard, which is also why we want to distribute this approach, with our partners, to other companies," he said. To commercialize this higher level of autonomy, BMW may need to add another partner. The automaker plans to deploy Level 4 and Level 5 vehicles in shared fleets, but has yet to announce a partnership with a ride-hailing service such as Uber or Lyft. Daimler, Volvo, Jaguar Land Rover, Ford, Waymo and General Motors are working with at least one of those services to ensure their self-driving technology is incorporated into a fleet. Buettner said BMW will decide on such a partnership in the next year, otherwise relying on its ReachNow car-sharing network to deploy its self-driving technology.